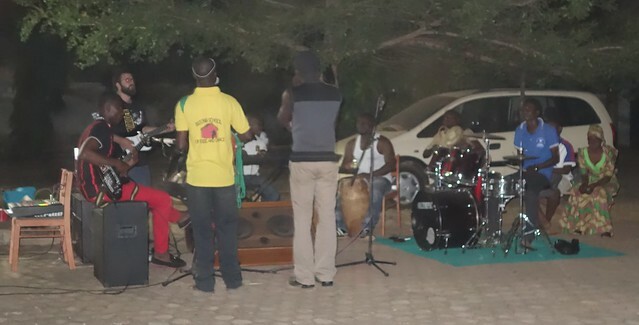 So for the past few months, my primary focus has been on attempting to foster a live music scene here in Tamale. I haven’t had much to write about until now, so here’s a brief update on some of the hurdles I’ve faced and what I’m doing now. Back in November, I started holding three to four rehearsals a week with several popular local singers. Rehearsals were intended to provide singers with the opportunity to have their own backing band, so that they could start playing live music instead of the standard playback or “miming” shows that dominate the music scene here. My plans for rehearsals were ambitious: to have seven to ten rehearsals a week, giving each singer the opportunity to rehearse at least once a week. As it turned out, holding even three rehearsals a week turned out to be a challenge. To organize a rehearsal, my routine went like this: call the singer and all of the bandsmen at around 10:00 am the day of to remind everybody about the rehearsal and make sure they show up at the scheduled time, usually between 4:00 and 6:00 pm. Text messaging and email are rarely used here, so organizing group events like rehearsal takes quite a lot of phone time, especially if one of those people has a conflict or needs to adjust the time. If that happens, then each member of the band needs to be called again, and the times re-verified. Of course, people can’t or don’t always answer their phones, so this process usually got stretched out over at least a few hours. Then the scheduled rehearsal time would roll around, and, frequently, everyone would be about an hour or more late, and it was not uncommon to have at least one no-show. As I discovered through this process, and confirmed with my Dagbani teacher, it is apparently less rude to say you will come and then come late or not at all than it is to say you can’t come, which seems akin to rejecting an invitation. This process was frustrating, to say the least. Rehearsals usually aren’t very productive when you’re missing a band member, and the whole process was beginning to feel like it was more trouble than it was worth. A couple bands managed to make some progress, learning three or four songs by mid-December well enough to perform them. One band member even suggested that we try to organize a show for Christmas, but since it was a week before Christmas and we had about 20 minutes of material to play, I thought it might be prudent to continue rehearsing. 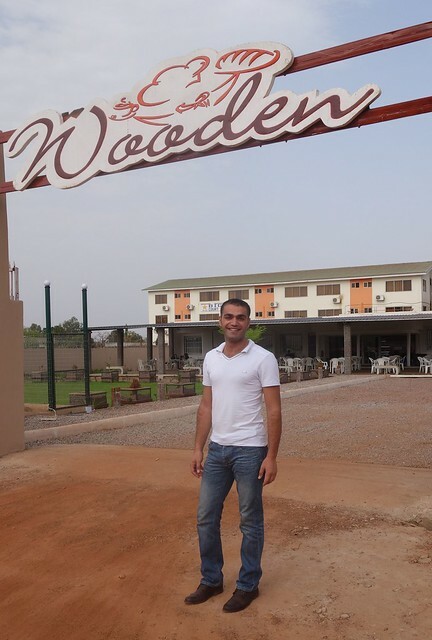 We soldiered on until Christmas, when I took a week-long vacation in Accra. Rehearsals couldn’t continue while I was away; the rehearsal space is in my house and I was usually playing guitar or bass at these rehearsals anyway. When I got back, it seemed like the motivation to keep practicing was gone. I tried to keep organizing rehearsals, but there was always a couple band members or even the singer who was out of town or busy or didn’t show, and the diminishing returns were beginning to take a toll on my morale. I tried to figure out what was causing this lack of momentum and how the rehearsal train had been derailed. I kept thinking back to saying no to the Christmas show. If I had scheduled a show that we weren’t ready for at the time, would the musicians have stepped up and gotten enough material together to play a more-or-less complete show? If there had been a successful Christmas show, would that have reinvigorated the waning motivation to rehearse? Possibly, but it seemed to me that there was a more general, systemic reason that my push for playing music was faltering. The more I thought about it, the more I realize that, for the singer, there was really no financial incentive to change. Most of the artists involved with Sakasaka Music are very well know regionally, and make a decent living for themselves doing playback/miming shows. To recap, playback or “miming” shows are live music events where a vocalist or group of vocalists perform onstage to backing tapes. These backing tapes are almost invariably copies of the vocalist’s or group’s album on a CD or pen drive that is given to the DJ before the show. That means that all the vocal tracks that you would hear on the album are played over the loudspeaker. This takes the pressure off the person or persons onstage to actually perform anything, in a musical sense. The resultant show is sometimes as basic as one person onstage with a muted microphone, dancing to a recording they made. Sometimes there will be one or two dancers onstage as well, but not usually. These performances can be lackluster to those accustomed to seeing music performed by live musicians: there’s just not that much going on onstage. There are reasons that these shows exist, though. As a musician, there is a very low overhead for these shows. You don’t have to pay a band to rehearse your songs, you don’t have to own, rent, or pay for the transportation of instruments, and you get to keep all the money from your shows. This money is not always a lot, too, sometimes only about GHS100, less than $40 at the current exchange rate. This kind of payout is nowhere near enough to cover the aforementioned expenses involved with playing with a live band. Thinking back on it now, it’s no wonder that the enthusiasm for the initial incarnation of my project waned away after a few months, especially without a scheduled show. It was too much investment for an unknown return. Even though I was providing the instruments and transportation without cost, the model was not sustainable: at the end of my grant term, in order to play live, the musicians would have to operate at a loss. I would have to find a different model through which to encourage live performance. A month or so ago, such a model presented itself. Iyad Hatoum, owner of a local restaurant called Wooden, asked me if I could put together a house band for his place. They’d play every other Saturday, and the alternate Saturdays could be filled by any solo acoustic performers I might know or discover. This patron model offers a more sustainable solution than the previous rehearsal model: musicians get paid a set price every gig, don’t have to worry about acquiring band equipment, and the shows are regular, so rehearsals feel like they are building towards something. Additionally, this employment opportunity is semi-permanent: it will at least continue after I leave, which the impetus to organize live shows without a patron to support them might not. So I went about contacting reliable musicians from the earlier rehearsals in putting together a band to fill this role. What I ended up with was an interesting mix of Dagomba natives and Tamale transplants: Abu Sadiq on vocals; Ahamed Abdul Samed, a Dagomba fiddler and singer so associated with his instrument, the gonje, that everyone just calls him Gonje; two Dagomba percussionists, Shani and Chief Suale; an Ewe man named Frank on keys; an Asante named Charles on the drums; a Nigerian named Humble on bass guitar; and myself on guitar. So far, rehearsals have been much more successful with the Wooden Band than they were with the previous model. Part of it is that the musicians are coming at regular times—Saturdays at noon and Mondays at 6:30—and also only twice a week, whereas before I was calling these guys to come play three or four times a week. Whatever the reason, it is working. 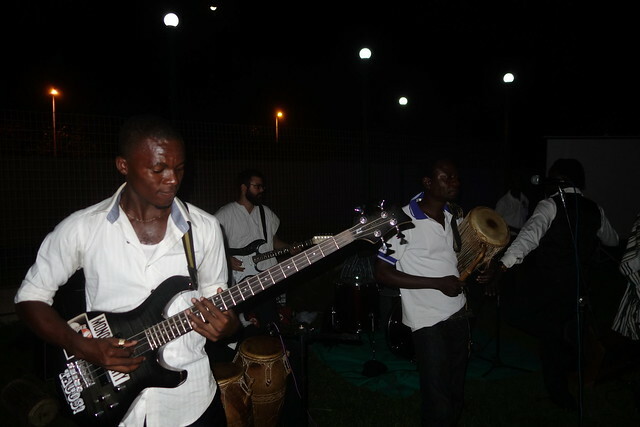 Our two vocalists, Abu and Gonje, bring two very different types of songs to the group. Abu is mainly a reggae singer, so when he brings songs they get adapted to fit the Dagomba instruments, whereas Gonje brings songs that come from the Dagomba tradition, and need to be adapted to fit the Western instruments. I’ve honestly been surprised at how easy and natural this process has been. At the time of this writing, we have just played our first show on Friday, March 7th, for a work party held at Wooden by Masara N’Arziki, an agribusiness with a large office in town. It was a great occasion to debut the band—there were around 270 people in attendance, which will help promoting future shows. Azindoo Live 3/7/2014 from Phil Babcock on Vimeo. Soyaya 3.7.14 from Phil Babcock on Vimeo. The music was well received, despite the fact that our PA was woefully underpowered, forcing us to crank the preamp gain on the vocals, which creates an unpleasant kind of distortion called “clipping.” This is an easy but expensive problem to fix—I have to buy a bigger amp. Hopefully video from our next show will demonstrate how our sound has improved. Check out more videos at sakasakamusic.com, or follow us on Facebook at facebook.com/sakasakamusic.